So I really love interiors, it's my favourite thing to dream and lust over on Pinterest. (Follow my boards here!) And as we're moving house I have an excuse to spend hours trawling through ideas and making new boards of inspiration. One room I love in life is actually my sister's bedroom. She's very tidy, like me, and loves simple lines and clean colours. So I thought I'd share some photographs to give you some inspiration of your own. Most of the furniture is the MALM collection from IKEA in white. It creates simple, non fussy lines around the room, making it look spacious and light. Photos and Prints are a great way of adding colours and themes to a simple room. The added yellow makes it a bright, happy space. The walls are painted in The Little Greene Company's 'Shirting' and 'Urbane Grey'. I love the slight warmth of the grey against the clean white, it makes the room a little more cosy. The Geometric print bedding is from George at Asda. Although I can't seem to find it online anymore, so they might have discontinued this design. I love the modern print though. 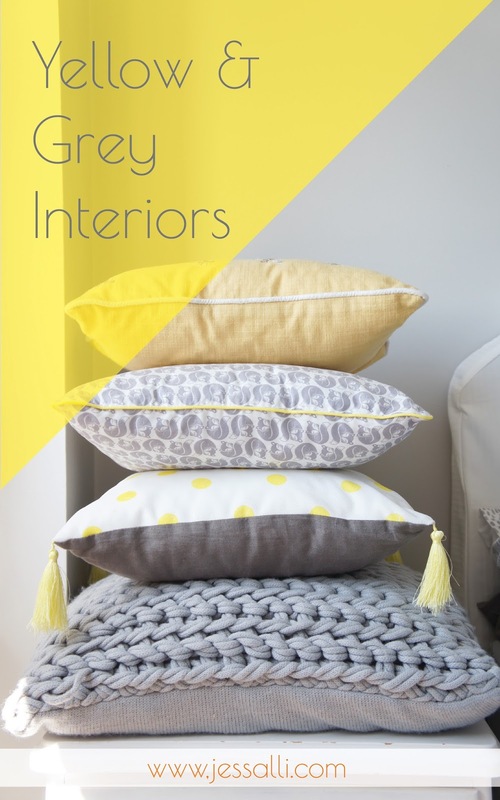 Lastly the sure way of adding colour and texture to any room is soft furnishings. And here are some fab cushions, some handmade by us, some from other handmade shops and some from other brands. The Fox print fabric is from Lewis and Irene. And the fun spotty cushion is from one of my favourite Etsy stores Love Joy Create. I really hope you liked this interiors post. Here's to many more (hopefully). Especially when I have my new house to play with.